Dancing is the oldest of the arts. Early man danced to describe what he was doing. This was even before he added simple music or songs to accompany the movements. The urge to dance, or to express ourselves by the movement of our bodies, is so basic that it must have existed in men, even in the ancestors of men for thousands of years. Dancing makes patterns in space and to have any real meaning requires a sense of rhythm. The body movement perform to some sort of regular beat or pulse. Rhythm is one of the most important features of dancing. As a little child I took few simple dance lessons in the dancing school of renowned Amala Shankar. Later I learned to dance in my school Loreto House, where I studied for 12 years. Our dance teacher was famous dancer and choreographer Shanti Bose. Along with other children I participated in the Bengali “Rabindra Nritya Natya” (Dance Drama) Chandalika. At an early age I realized that dancing was not just a matter of dance steps. Certain signs have been carefully worked out and instinctive actions play an important role. Signs have always been used by people to communicate with each other. Example: A nod of the head means the same thing in most parts of the world. Rhythmic movement of fingers and hand gestures are used to express various emotions. Why should children learn to dance at a young age? As a doctor now I know the reasons. 1) Dancing is an excellent form of physical exercise. 2) It is an artistic expression through the use of the body. Dancing helps in creative and artistic development of a child. 3) Dancing enhances physical function, mental health, and well-being of a toddler. 4) Dancing improves muscular endurance and strength of the legs. 5) The body becomes more flexible. There is strengthening of lower legs which improves balance and agility. Dancing increases aerobic power and makes one more energetic. 6) It psychologically prepares a child for more serious activities as it improves brain function. Learning complicated dance steps improves memory. 7) It has a positive effect on cardiovascular system and improves heart’s ability to pump blood to the lungs. 8) Dancing helps to keep the joints flexible, the muscles around the joints strong. There is greater strength of hip joint. 9) It strengthens the spinal column and the supporting muscles, ligaments, and tendons. 10) A child grows up to have a graceful bearing and gait. 11) Body of a dancer is trim and fit, with greater than average range of motion. 12) Dancing instantly elevates mood, boosts happiness, increases confidence and self-esteem and reduces stress. As a world traveler I have seen some exceptionally beautiful dance forms like Ballet, Waltz, Tango, Belly Dancing and various types of folk dancing. I was not born to be a dancer but I have great respect for all professional dancers. They belong to a fascinating world and will remain eternally young and healthy. Many medical terms originate from fascinating Greek mythology. Today’s post is about a congenital malformation Cyclopia. Cyclops appear for the first time in literature in Homer’s Odyssey (8th-7th century BC). In the beautiful poem called the Odyssey the Greek poet Homer describes how the hero Odysseus while returning home from Troy to his own kingdom of Ithaca, landed on an island of the Cyclopes. Cyclopes are giants who had one eye, placed in the centre of their foreheads. They were shepherds and looked after their sheep by day, returning at night to sleep in caves. Odyssey and some other sailors came to one of these caves which belonged to a giant called Polyphemus. The giant captured the Greeks and started to eat them for dinner. At last Odysseus found a long pole and while Polyphemus slept, he thrust it into the eye of the giant and blinded him. Smart Odysseus told Polyphemus that his name was “Nobody”. Brilliant idea and something to keep in mind in the modern age. When the giant screamed out in pain other Cyclopes came running out to help him.Polyphemus cried out that “Nobody” had hurt him. To this the Cyclopes replied that if no man had hurt him then it must be one of the gods and, telling Polyphemus to bear the pain as best as he could, they went away again. 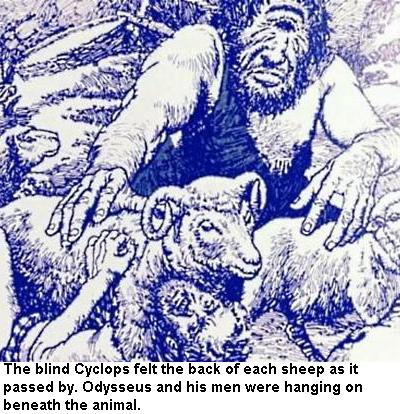 Blind Polyphemus tried in vain to catch his prisoners by feeling the back of each sheep. Odysseus and his men escaped by clinging on to the wool underneath the sheep. In many ancient Greek stories there is evidence that one eyed Cyclopes had built great walls. The word Cyclopean is still sometimes applied to massive stone structures. Holoprosencephaly are a group of disorders arising from failure of normal forebrain development during embryonic life. There are three forms of holoprosencephaly: alobar, semilobar, and lobar varieties. Cyclopia (alobar holoprosencephaly) is a rare and lethal human malformation, resulting from incomplete cleavage of prosencephalon into right and left hemispheres. Approximately 1 in 100,000 births are identified as infants with cyclopia. Cyclopia typically presents with a median single eye or a partially divided eye in a single orbit, absent nose, proboscis (nose of a mammal, usually long and flexible) like structure on forehead above the eye. Extracranial malformations described in stillbirths with cyclopia include polydactyl, renal dysplasia, and an omphalocele. 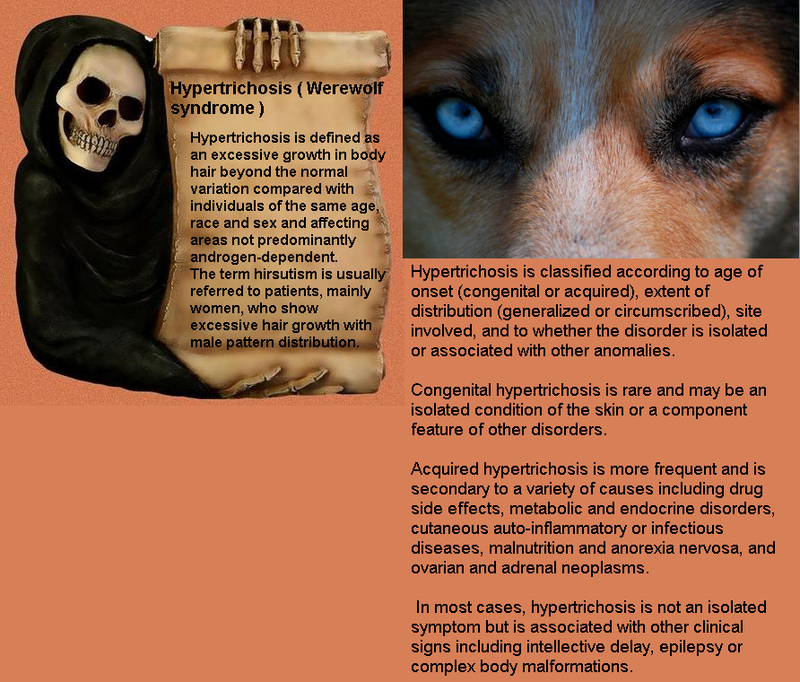 The etiology of this rare syndrome is not clear. Possible risk factors include: maternal diabetes , infections during pregnancy (TORCHs), drugs during pregnancy (alcohol, aspirin and many other teratogenic drugs), exposure to ultraviolet light, and chromosomal anomaly like trisomy 13 and genetic cause. No one knows whether one eyed Cyclops actually existed or not, but the congenital ophthalmic disease, Cyclopia is certainly named after these mythical characters and we will never forget these giants. Cyclopia: a rare condition with unusual presentation – a case report. King Tutankhamun – What caused his mysterious death? “Today the traveller on the Nile enters a wonderland at whose gates rise the colossal pyramids of which he has had visions perhaps from earliest childhood. James Henry Breasted”. To know the people and a country you have to visit it. Talk to the people, look into their eyes and try to understand their local culture. 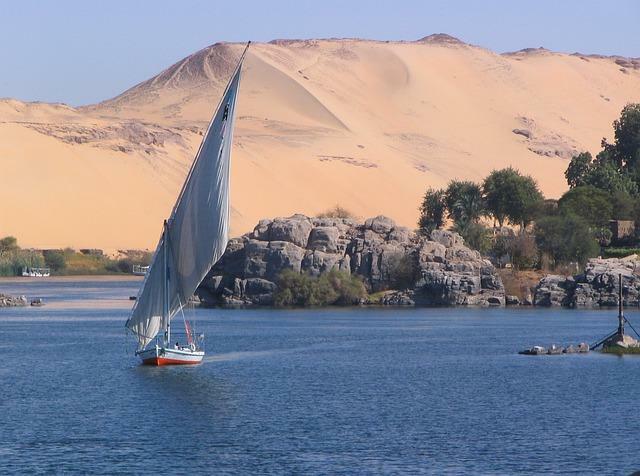 Egypt is an enchanting country with many exciting stories and unsolved mysteries from the past. Some of the most intriguing questions are related to mysterious death of the great Pharoah (king) Tutankhamun. The most exciting discovery of ancient Egyptian remains was that of the tomb of Tutankhamun, the last pharaoh of the XVIIIth dynasty. The tomb was found in 1922 by an Englishman called Howard Carter who was member of an expedition team led by Lord Carnarvon. The tomb was in the Valley of the Kings, where so many Egyptian kings were buried, but this was only one that had not been broken open or robbed of its treasures. The mummy of Tutankhamun himself was enclosed in a decorated coffin of gold, which in its turn was inside two wooden coffin and a stone one. The face of the mummy was covered with a gold mask, decorated with precious stones and there were gold ornaments on the head. 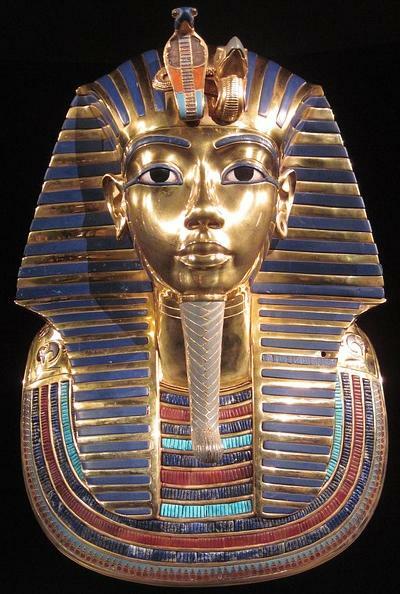 Tutankhamun became king when he was only 12 and died unexpectedly at the age of 18 years. If his tomb had not been found with all its treasure he would have been forgotten long time ago. A curious superstition sprang up about the tomb of Tutankhamun. It was said that the people who broke it open were committing an offence against something sacred, and that they would meet sudden death as a result. Strange incidents happened and several people connected with discovery did die tragically, one of them being Lord Carnarvon, who died in Egypt, from poisonous mosqito bite and pneumonia, five months after the finding of the tomb. The cause of King Tutankhamun’s death has been matter of speculation for several decades. 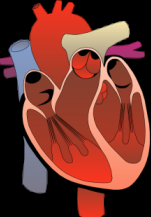 Many interesting medical articles have been written on this subject. 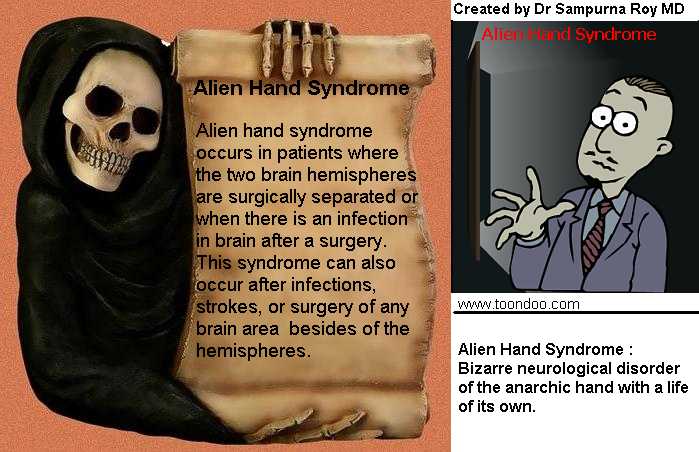 According to Hussein et al pathological findings included craniofacial dysmorphia, bilateral alterations of the feet, malarial disease and an acute traumatic fracture of the knee. Hawass et al. 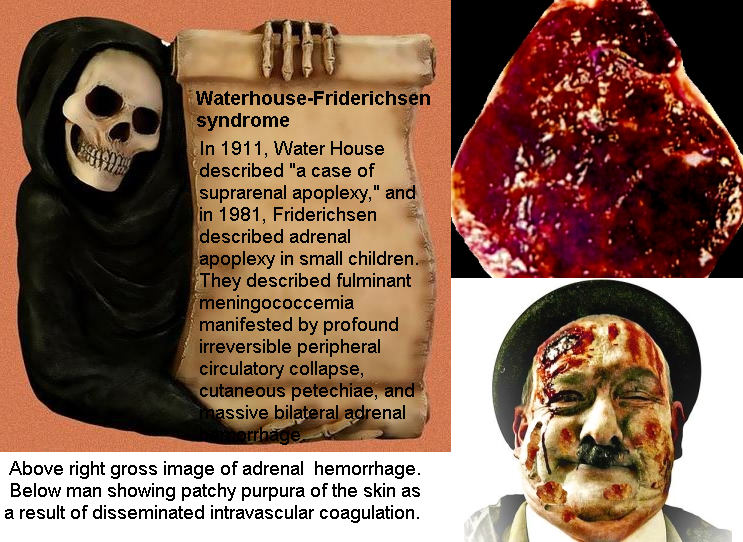 used imaging, anatomical and DNA techniques and suggested Plasmodium falciparum malaria, concomitantly with Morbus Köhler-Freiberg, as his probable cause of death. The authors also indicated that there were no signs of gynecomastia and craniosynostoses (eg, Antley-Bixler syndrome) or Marfan syndrome. Genetic testing for STEVOR, AMA1, or MSP1 genes specific for Plasmodium falciparum revealed indications of malaria tropica in 4 mummies, including Tutankhamun‘s. These results pointed to avascular bone necrosis along with the malarial infection as the most likely cause of death of Tutankhamun. According to Timmann et al “The age of 18–19 years attributed to Tutankhamun makes malaria as his primary cause of death rather unlikely, as a certain degree of semi-immunity may readily be assumed.” Plasmodium falciparum malaria was endemic in ancient Egypt and probably caused death. Local residents after continuous exposure to plasmodium developed immunity against both parasites and disease. Fatal courses of malaria usually affect young children (6- 9 year) and pregnant women but not adults. According to Timmann et al bone lesions of two metatarsals of the left foot and shortening of the second left toe, indicated advanced osteonecrosis, osteomyelitis or ulcerative osteoarthritis in the article by Hawass et al. These radiographic findings are consistent with osteopathological lesions as often noted in sickle cell disease , a haematological condition described to occur in many local residents of Egypt (El-Beshlawy & Youssry 2009). The occurrence of anaemia, other pathological haematologic disorders, and of the haemoglobin mutation that causes sickle cell disease (HbS) has been demonstrated in predynastic Egyptian remains (Marin et al. 1999). Avascular osteonecroses, inflamed by osteomyelitis and septicaemia due to pathogenic agents including Salmonella and Staphylococcus, are known sickle cell disease complications and may be exacerbated by malaria attacks. Gaucher’s disease (type 1-3) should be considered which may cause painful avascular osteonecroses. 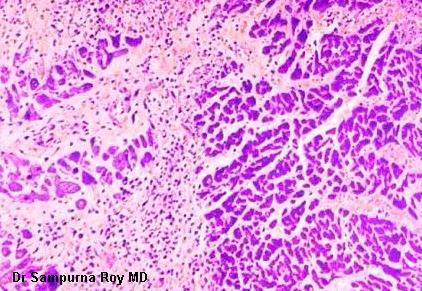 Gaucher’s disease is a rare autosomal-recessive lysosomal storage disease and has been described in Egyptians. Other features considered in the differential diagnosis of avascular osteonecroses in King Tutankhamun’s bones included other inheritable and non-hereditary disorders – trauma, sequelae after osteomyelitis, acute pancreatitis and systemic lupus erythematosus. 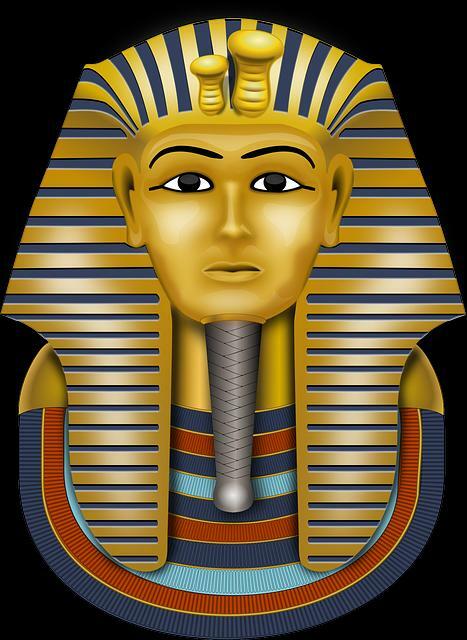 Brandt G. suggested the theory that Tutankhamun may have suffered from hypophosphatasia, an inherited metabolic disorder that affects especially the musculo-skeletal system in many ways. The author has compiled both medical and archaeological findings to support his theory and suggests that existing DNA samples of Tutankhamun and other members of his family should be tested for defects on the ALPL gene. The question on Tutankhamun‘s supposed gynaecomastia cannot be answered as most of mummy’s chest wall was missing. All the scientific findings can neither be proved or ruled out. We do know that the most common diseases of Ancient Egypt were traumatic injuries, malaria and tuberculosis. King Tutankhamun is one of the most famous king of Ancient Egypt. 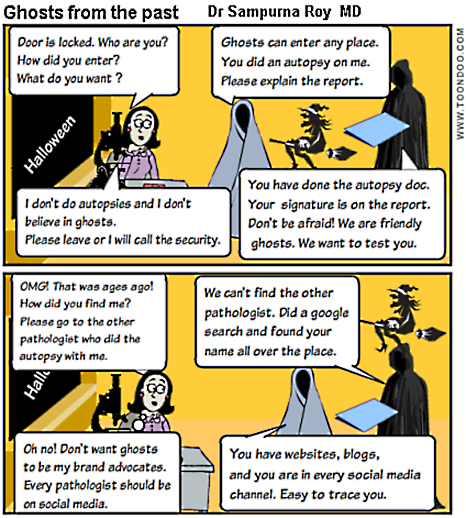 It is not surprising that extensive scientific studies have been made to find the actual cause of death. Infectious disease, metabolic disorder, neoplastic lesion, trauma (crash of his chariot causing lethal injury) and even murder have been suggested by various authors. The cause of death of the great ruler of Egypt will continue to fascinate researchers. I wrote a similar post about Death of Alexander the great – A medical Enigma. The difference between the two cases is that the remains of Alexander the Great was not found, hence anatomical and other scientific examinations could not be done. In case of King Tutankhamun extensive studies including virtual autopsy, imaging , anatomical and DNA analysis were performed. Subcutaneous packing in royal Egyptian mummies dated from 18th to 20th dynasties. Tutankhamun: evidence-based paleopathology versus “curse of the pharaoh” . Purported medical diagnoses of Pharaoh Tutankhamun, c. 1325 BC-. Did Tutankhamun suffer from hypophosphatasia?–A hypothetical approach. Paleopathology of the juvenile Pharaoh Tutankhamun-90th anniversary of discovery. Inheritance patterns and pathology of Tutankhamun, Akhenaten, and the eighteenth dynasty pharaohs of ancient Egypt. Familial epilepsy in the pharaohs of ancient Egypt’s eighteenth dynasty. Tutankhamun: An adrenal tumor? Lancet. 1972;2:1312. Forensic and pathology remarks concerning the mummified fetuses of King Tutankhamun. Mummified daughters of King Tutankhamun: archeologic and CT studies. Malaria, mummies, mutations: Tutankhamun’s archaeological autopsy. Ancestry and pathology in King Tutankhamun’s family. Skeletal dysplasia in ancient Egypt. Prometheus – A captivating tale of Liver Regeneration. To a New Yorker this is a very familiar statue. To a tourist and a world traveller it is a precious memory. 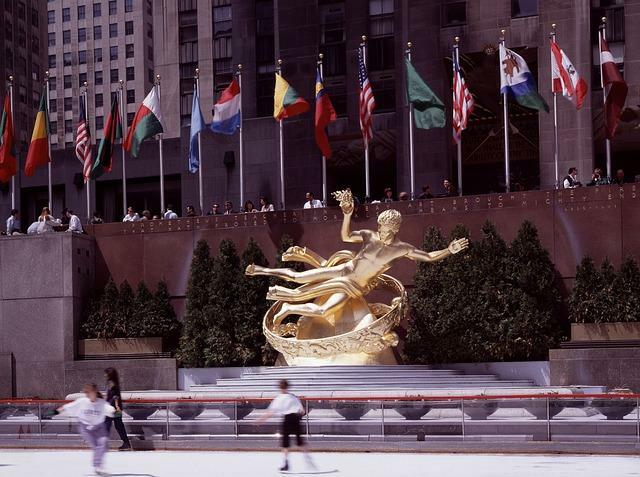 I first heard the name “Prometheus” when I visited Rockefeller Center in New York and saw the iconic sculpture. My today’s story is about Prometheus and his link to Pathology of Liver Regeneration. 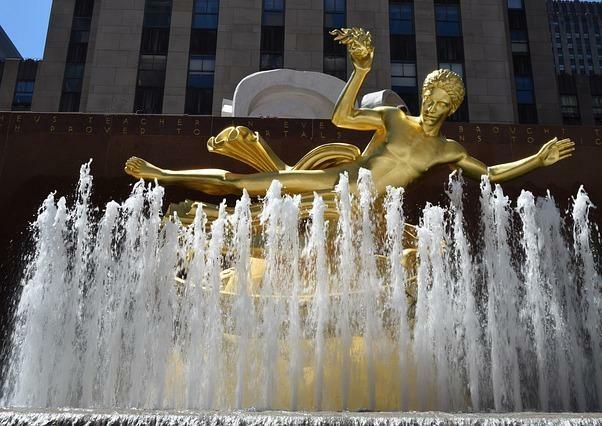 According to ancient Greek belief, Prometheus was one of the Titans, a group of gods even older than the Gods of Olympus led by Zeus. Some stories told how Prometheus created man, first making images in the likeness of gods and then giving these images life. After he had put them on earth he gave them a torch which he had lighted at the chariot of sun, and in this way men first got fire. 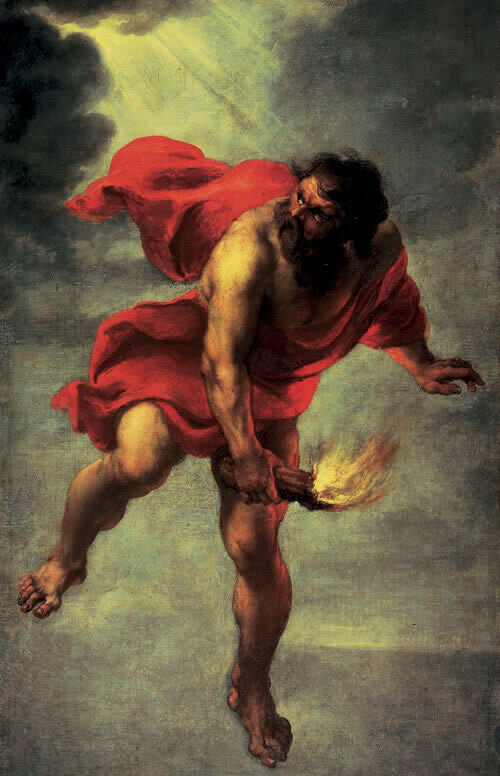 The younger god Zeus later took away this gift of fire when he quarrelled with the people on the earth, but Prometheus discovered where he had hidden it and brought it back again. 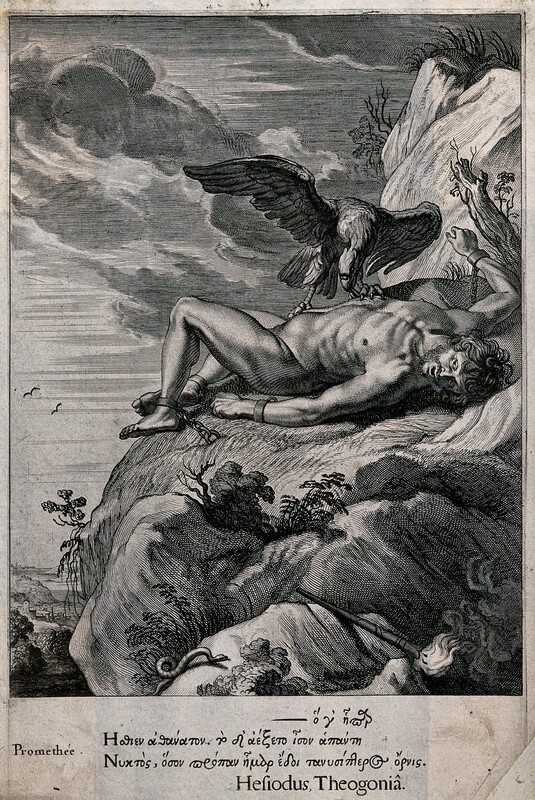 In revenge Zeus chained Prometheus to a rock in the Caucasus Mountains and sent an eagle to eat his liver. The most interesting part of this story is that Prometheus was immortal and the liver grew back to its original size again in the night. Day after day the eagle came back and ate it again. 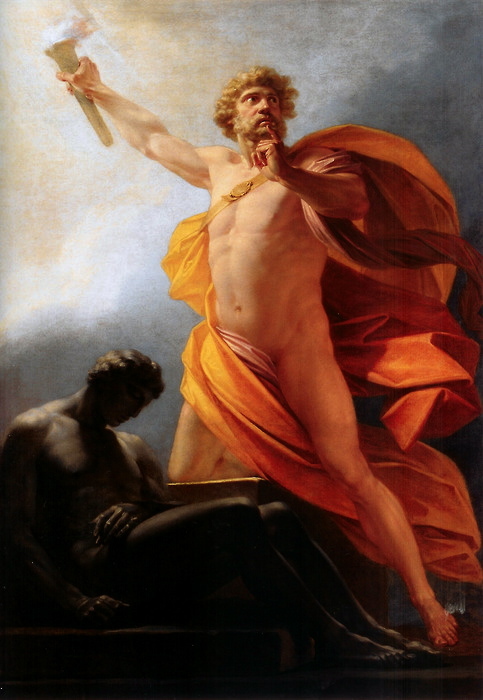 At one time Zeus offered to release him if he would reveal a secret which threatened the rule of the Gods, but Prometheus refused to be freed in this way. He bore his torture because he knew that in 13th generation a son of Zeus would save him. That is exactly what happened, for the hero Hercules, who was one of Zeus’s sons, killed the eagle and set Prometheus free. Stories of punishment of Prometheus are frequently used by lecturers on liver regeneration. According to Dr Chen et al liver was considered immortal not only because of it’s power of regeneration but because ancient Greeks believed that the liver was the seat of soul and intelligence. It is clear that ancient Greeks knew about liver’s potential for repair. The fact that the organ grew at night as the eagle ate all day indicates the rate of hepatic regeneration. According to the myth the eagle came every other day, allowing full day to regenerate. The author concluded that the close match between the amount of liver tissue removed by the eagle, the amount and appropriate rate of recovery suggested that the ancient Greeks had some idea about hepatic regeneration. 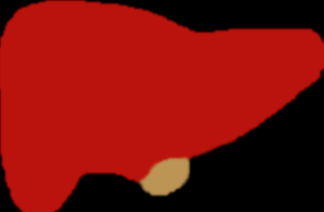 The normal liver consists of a stable population of hepatocytes with a slow turnover rate. It has a remarkable capacity for regeneration. It can restore approximately three-quarters of its own mass within within six months. After surgical resection and during recovery from submassive liver necrosis, upto 70% of the human liver regenerate. In experimental animals (rat liver) the hepatocytes have an annual turnover of one mitosis per year. After partial hepatectomy there is a burst of mitotic activity so that the liver weight doubles within 48 hours and return to normal weight after 3 to 6 days. In human liver, regeneration also occurs rapidly. 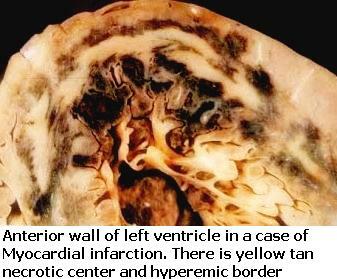 This is noted in cirrhotic liver. After major hepatic resection for tumour, regeneration of normal hepatic volume occurs by 3 to 6 months, and liver function appears normal within 2 to 3 weeks after surgery. Many factors influence regeneration but the precise triggers which stimulate increased mitotic activity are still unknown. Hepatic growth factor regulators can be broadly divided into groups : nutrients and hormones, polypeptide growth factors not necessarily specific to the liver and serum or liver-derived growth factors with greater specificity for the liver than other tissue. The responsiveness of hepatocytes is strongly influenced by their metabolic state. Epidermal growth factor may be one of the hepatotrophic factors with an important role in maintaining hepatocellular function and aiding cellular repair and regeneration. All those interested in Liver pathology and regenerative medicine will continue to be enthralled by the interesting story of Prometheus, the Greek Titan, who brought fire to mankind. A mythical character whose liver grew back every night after it was torn and eaten everyday by an eagle. Prometheus bound: evolution in the management of hepatic trauma–from myth to reality. Whither prometheus’ liver? Greek myth and the science of regeneration. Promethean medicine: spirituality, stem cells, and cloning. The myth of Prometheus mirrored in intensive medicine. Hepatic Regeneration-Revisiting the Myth of Prometheus. Liver regeneration. The Prometheus myth in the light of molecular biology. Liver regeneration 7. Prometheus’ myth revisited: transgenic mice as a powerful tool to study liver regeneration. The myth of Prometheus and the liver. Myth of Prometheus in experimental reality; biochemical researches on the regeneration of the liver. A20–an omnipotent protein in the liver: prometheus myth resolved? 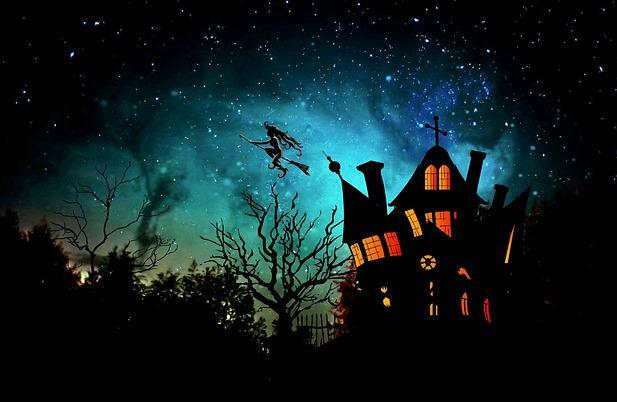 Halloween is an ancient celtic tradition celebrated on 31st October. It is fun time for children and is very popular in many parts of the world. Dangers of trick-or-treating come in many forms. Halloween diarrhea’ caused by artificial sweetener sorbitol in the candy. Doctors and parents should take special precautions in cases of children suffering from juvenile diabetes. Excessive intake of candy without proper oral care may cause tooth decay or dental caries. Consumption of processed products with excess amounts of salt, sugar and fat can cause obesity and food allergies. There can be an outbreak of serious foodborne infectious disease. Cases of deliberate tampering, poisoning and insertion of foreign material in the candy have been reported. Example: A case of perforated appendicitis due to intake of pin. 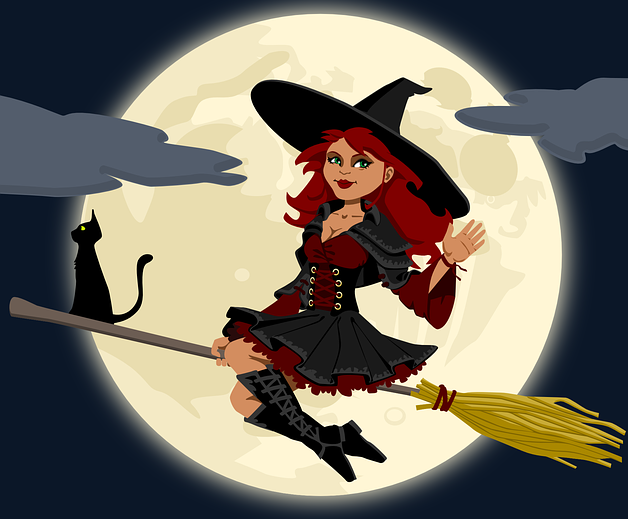 There are many cases of burns and house fires during Halloween celebrations. 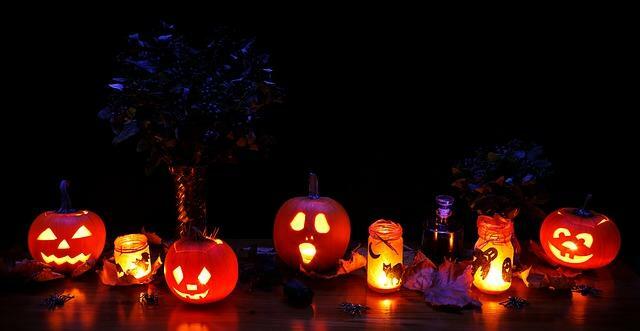 It seems that pumpkins have a round base and some containing many candles can easily overturn causing fires and burns. Studies suggest the number of childhood pedestrian deaths increased fourfold among children on Halloween evenings when compared with all other evenings. Face paint may contain toxic levels of lead. A study on behaviour of children showed that when children were told to take only one candy, anonymous kids took more candies compared to those children whose name and address were known to the giver. Self-awareness and transgression in children: two field studies. • Parents should establish a route for children in a known neighbourhood. • Children should use flashlights, stay on the sidewalk, stop at intersections and cross intersections in a group. • Motorists should drive slowly and look carefully for children on medians and in alleyways and driveways. • Children should consider wearing makeup instead of masks, or wear masks that do not obscure sight or hearing. • Parents should establish a curfew for older adolescents. • Children should travel in small groups, be accompanied by an adult, visit only well-lit houses and remain on porches rather than entering houses. • Children should know their phone numbers, carry coins for emergency telephone calls and have their names and addresses attached to their costumes. • Rigid or sharp costume knives or swords should not be used. 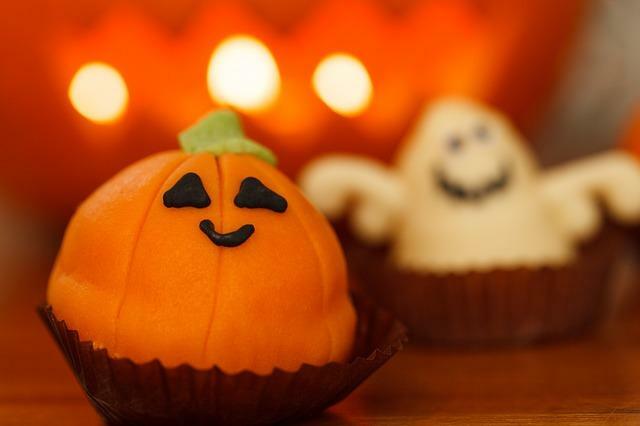 • All treats should be brought home so that parents can inspect them. 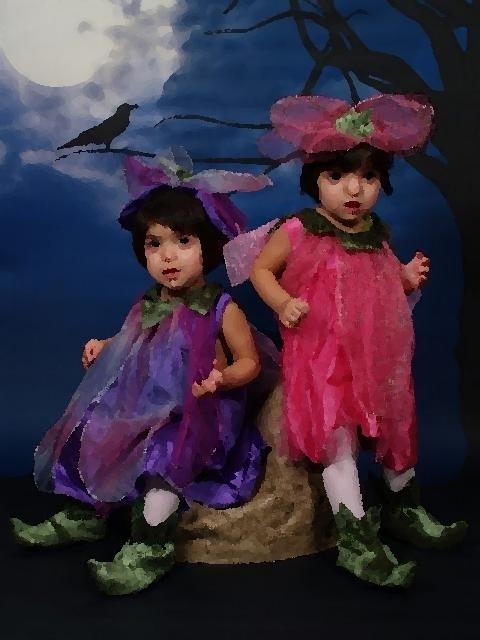 The dark side to Halloween: marketing unhealthy products to our children? Trick or treat? Enjoying halloween when you have diabetes. Trick, treat, or toy: children are just as likely to choose toys as candy on halloween. 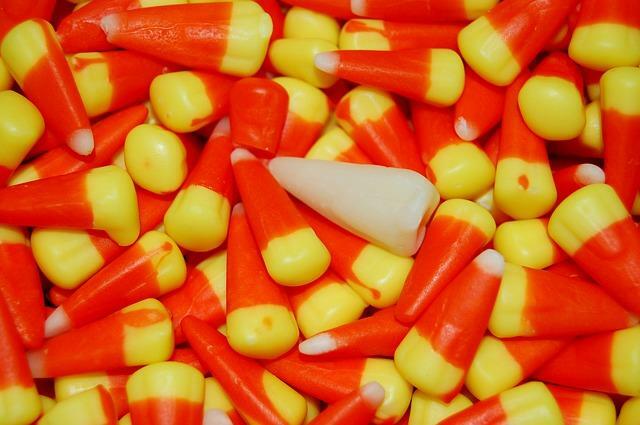 Routine screening of Halloween candy: helpful or hazardous? ‘Halloween diarrhea’. An unexpected trick of sorbitol-containing candy. Should we X-ray Halloween candy? Revisited. Halloween appendicitis: pin perforation of the appendix. X-raying Halloween candy: a public service? Should we X-ray Halloween candy? Childhood pedestrian deaths during Halloween – United States 1975-1996. MMWR 1997;46:987-90. 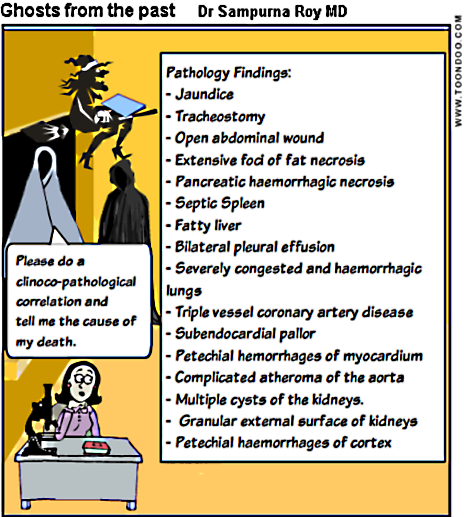 Post mortem examination revealed the progression of complications from acute pancreatitis leading to multiorgan failure. 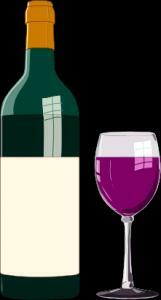 The fatty changes of the liver suggest that there was predisposing alcoholic liver disease. Previous history of alcoholic pancreatitis and the long standing fibrosis seen around the ampulla of Vater supported this. This perhaps meant there was an increased risk of pancreatitis from the likely swelling and edema following Endoscopic retrograde cholangiopancreatography (ERCP). The pancreas was completely necrosed and the lipases released from the destroyed acini lead to the extensive fat necrosis in the abdomen. The organs confirmed that infection must have occurred from any one of the invasive procedures or surgery. Spleen had a classic septic appearance. 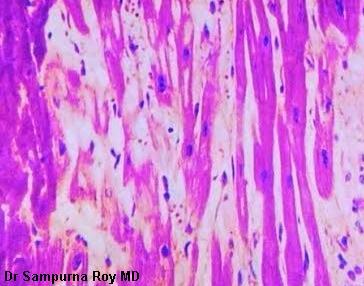 There was evidence that disseminated intravascular coagulation may have resulted with the appearance of red spots in the renal cortex and myocardium. 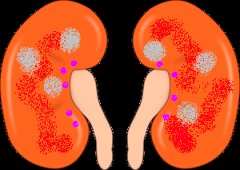 The features in the kidneys were consistent with the anuric, acute renal failure. The lungs were seriously congested and airways contained large amount of blood (haemoptysis) necessitating the tracheostomy seen. 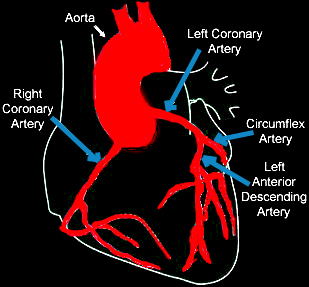 The final stage was most likely that a combination of the hypotension and ischaemia from his triple coronary artery atheroma (caused by the above events) lead to a subendocardial infarction. Man’s existence on earth depends on all the other living matter around him and a large part of this belongs to the plant kingdom. Without the extraordinary variety of living organisms that make up the world of plants, animal life could not survive and our planet would be barren and lifeless world of deserts. There is widespread epidemics of obesity, heart disease, depression and mental illness affecting people in many developed and developing countries. According to researchers exposure to green space has a positive effect on the health of an individual living in a noisy, densely populated city. Some plants are of more use than others. High on the list of plants on which our lives depend are the food crops like wheat, rice, oats, sugar cane. Then there are green vegetables and great variety of fruits. Grasses provide the basic food foodstuff for cattle and sheep, on which man depends for milk and meat. Some plants give us beverages like tea and coffee. Medicinal plants give us quinine and morphine. More powerful antimalarial drugs are used nowadays. Microscopic plants belonging to the group known as fungi provide antibiotics such as penicillin and streptomycin to fight disease. In many countries plant material is used to provide heat by the burning of coal and wood. Wood is used to build furnitures and buildings. Some plants are used to make clothes. In most cities, trees are planted and parks are created to improve the environment. Parks provide an important place for people to be active and socialize with friends in a calm and beautiful environment. Walking in the green space is linked to a lower likelihood of being overweight or obese. It is associated with lower rates of diseases such as type 2 diabetes mellitus, colorectal cancer and osteoporosis. Walking in the nature is an excellent form of exercise for patients recovering from coronary heart disease. Contact with natural environment reduce anxiety and tension and helps in dealing with stressful situation. Regular walking in a beautiful, green environment improves cholesterol level and controls blood pressure. A city dotted with many parks and gardens can reduce noise and air pollution and elevate the mood of the residents naturally. After a walk in the garden there is increase in focus and productivity of work. There is significant improvements in overall health, asthma, and other respiratory problems. 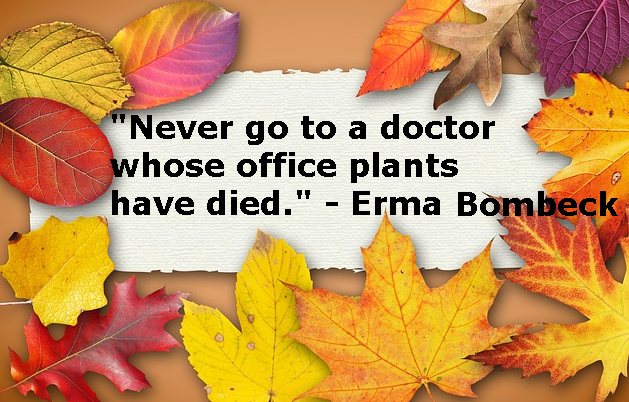 Researchers have concluded that presence of indoor plants increased patient’s tolerance to pain. When the working place is decorated with green plants and flowers, there is decrease in health complaints from the workers. Green spaces has a positive effect on pregnant mothers. Studies have shown beneficial effect of exposure to green spaces on birth weight of the baby. If you are hungry cook a meal with green leafy vegetables and relax with a cup of green tea. 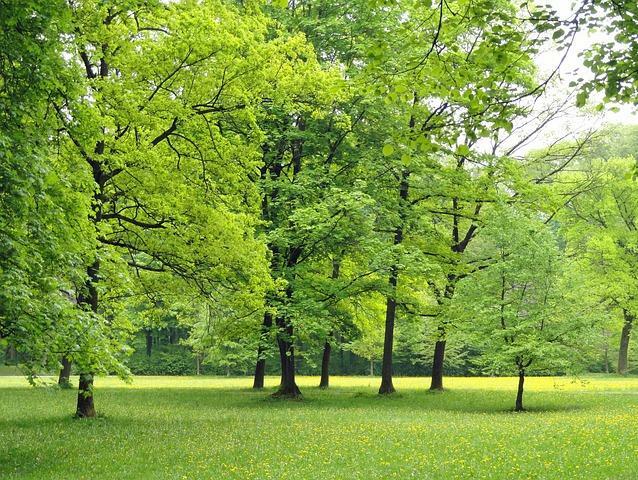 If you feel irritated, impulsive, impatient, frustrated, stop working and take a walk in the green space. Create a cheerful and pleasant environment by decorating your work space with green plants.